"Two old ergaster in the arid environment of Africa 1.5 million years ago." Episode 1: "Hunt or Be Hunted"
"Begin in prehistoric Africa – 1.7 million years ago – where primitive humans like Homo ergaster foraged for food among the underbrush, always on the run from the original king of the jungle – the Sabretooth cat. Over time, watch as ergaster develops simple tools, begins to communicate and even learns to repel his enemies with fire." "Fast-forward a million years and witness Homo erectus' improved ability with fire. Watch as these crafty humans use huge, flaming branches to drive a herd of Giant Irish Elk right off a cliff. It seems like a perfectly executed hunt . . . until the neglected fire burns out of control, ruining the day's spoils." Episode 2: "Mastering the Beasts"
"By the Pleistocene era, the Cro-Magnons had developed the power of speech, reasoning skills and even a belief in the afterlife. Yet, a dramatic recreation of a ritual battle, in which an apprentice shaman struggles to prove himself against a powerful prehistoric bull, shows how much of their daily lives were still rooted in violence." "As the Cro-Magnons' numbers grew, they proceeded to America – by way of a treacherous land bridge leading to Alaska. 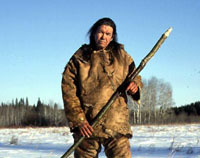 Join three, desperate Cro-Magnon women as they trek across the tundra in search of food and shelter and marvel at how they use their burgeoning ingenuity to survive harsh elements, extreme hunger and the company of Woolly Mammoths." 1.9 mya early African "Homo erectus"
also known as a special type of "Archaic Homo sapiens"
"Early Modern Man" aka Cro-Magnon aka "Anatomical Modern"
"they must lunge and jab"
"they had no real long-range weapons"
The most recent Neandertal = ca. 26,000 ybp ?? About 35,000 ypb the Neandertals disappeared so suddenly; this is the "Neandertal Problem"
About 40,000 ybp "a new human type [Cro-magnon] began to spread across Europe"
30,000 - 35,000 ybp modern humans went through a "rapid cultural explosion"
Is it an Early Homo sapiens sapiens? Or maybe a late Homo erectus? "This is the most significant fossil in Israel." ca. 2 mya (1.7 - 1.8) Homo erectus spread across Europe and to Asia, and "a new species evolved from Homo erectus all over the world"
Louis Binford: Neanderthals made inefficient use of fire. They also didn't plan ahead and take advantage of predictable events (like a salmon run). They were exploiting the environment "on an encounter basis" rather than on "a tactical one." 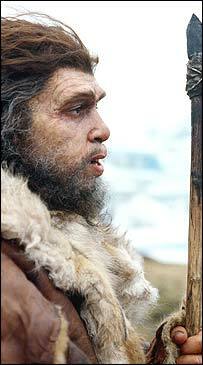 there were seldom over twenty"
The Neandertals were "ice age specialists." But it is also said that the Neandertals were "generalists, not specialists" in the sense that "everyone had to know how to do every thing"
And about ca. 35,000 ybp there was an increase in the cold of 5 - 6 degrees F.
Neandertal "diagnostics": low forehead, high brow ridges, large nasal opening, prognathasm, recessed chin, and "teardrop shaped head"
The skull is missing from the Neandertal in Kebara Cave. Could this be "like a Catholic relic?" One must have at least 250 participating in the same mating system, "Otherwise you are doomed." Are they a separate species, or are they a variety of Homo sapiens? Did they interbreed with the Cro-Magnon? If so, are any Neandertals ancestral to any contemporary humans? Did the Neandertals speak a language? "only a few thousand Neandertals inhabited Southern France"
"first to leave such evidence of caring"
Late Homo erectus or early Homo sapiens?